Shimmering, glimmering jewels for your feet. Slip on the Incastone and watch the mosaic of studs catch the light. 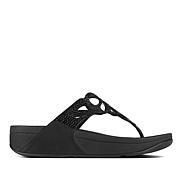 Feel as wonderful as you look in thong sandals ergonomically engineered for comfort. Featuring multi-density Microwobbleboard™ midsoles, they offer pressure-diffusing cushion below and soft, sueded fabric above. In a word — irresistible. I bought these last year in nave with the toe thong and blush in the slide ins. I wore them all summer and loved them. I just bought 3 more pairs of fitflops for my his year. I have a small foot and other fit flops just swallow my foot up but these actually fit and feel great. Great!! very comfortable.I ordered 5 and i normally 6 and fits perfect. These are so pretty and sparkly. Comfortable and semi dressy. My color was navy. Perfect amount of height. Good quality. Pretty sparkle. Footbed feels smooth and comfortable on my feet. Price on sale was awesome. Fit is a little loose but I will keep these. Might order a size down next time.